Edmund Browne, an architectural assistant in the Craig Hamilton Architects office, has submitted a beautiful measured drawing of Buntingsdale Hall in Shropshire for the Georgian Group Measured Drawing Prize 2017. Buntingsdale Hall is attributed to two architects, begun by John Prince c.1719 and probably completed by Francis Smith of Warwick c.1721. The house is in local red brick and sandstone, and the entrance front depicted in this elevation drawing is a characteristically baroque composition of the period. The house was extended in a matching style in 1857 by S. Pountney Smith of Shrewsbury, and Andor Gomme in his monograph on Smith attributes the balustrade crowning the original façade to this period also. 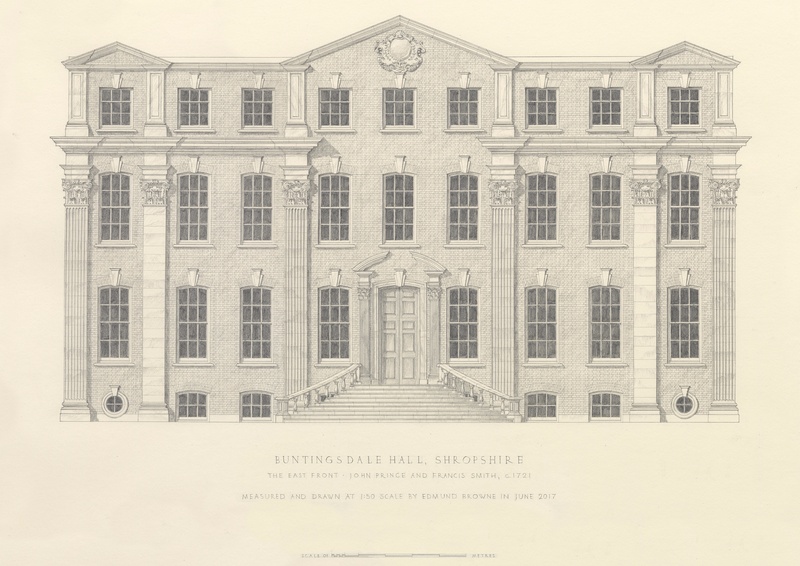 The nineteenth-century additions have been omitted for this drawing to depict the building in as close as possible its original 1720s form. The measurements were taken by hand in June 2017 and drawn up in pencil at 1:50 scale. In the Easter 2017 issue of Country Life John Martin Robinson describes Craig Hamilton's Chapel of Christ the Redeemer at Culham as "perhaps the most complete artistic creation of its kind in modern Britain".